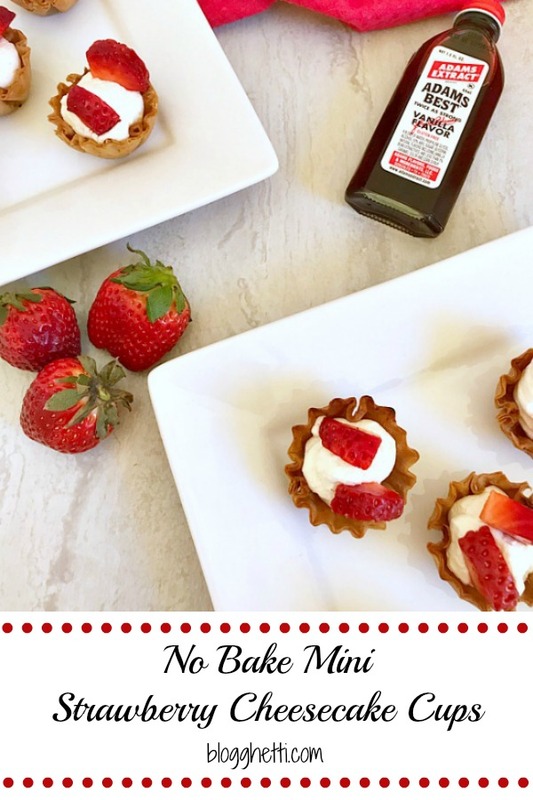 Individual servings of these No Bake Mini Strawberry Cheesecake Cups do not disappoint. Easy to make for desserts, brunches, or when the cheesecake craving hits. This is my last recipe for #SpringSweetsWeek and it’s a super easy, no bake dessert. I actually made this recipe in place of another one I was going to do. You see, originally the Strawberry Cheesecake filling was going to be individual parfaits. 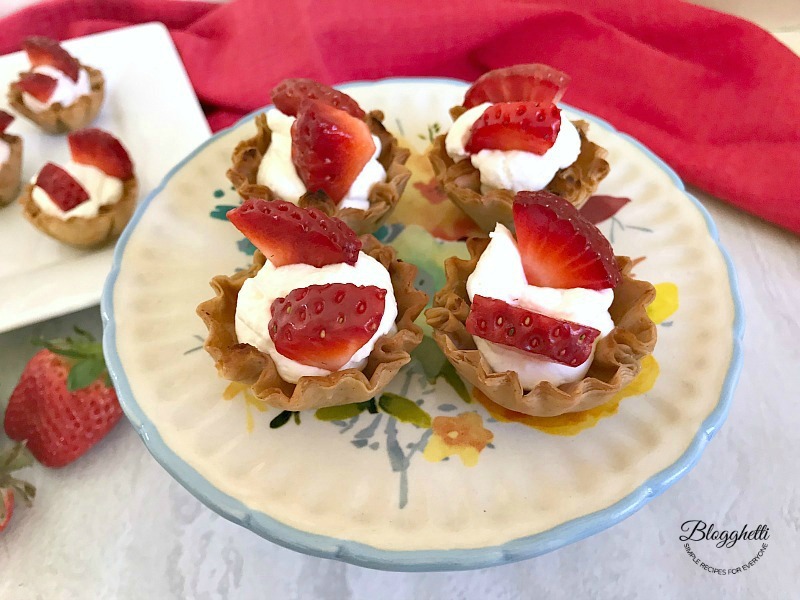 I found phyllo cups made from graham crackers in my grocer’s freezer section, and it hit me – make this recipe even easier by using already baked graham cracker cups. Who doesn’t love a good no bake recipe when you can get cheesecake from it? 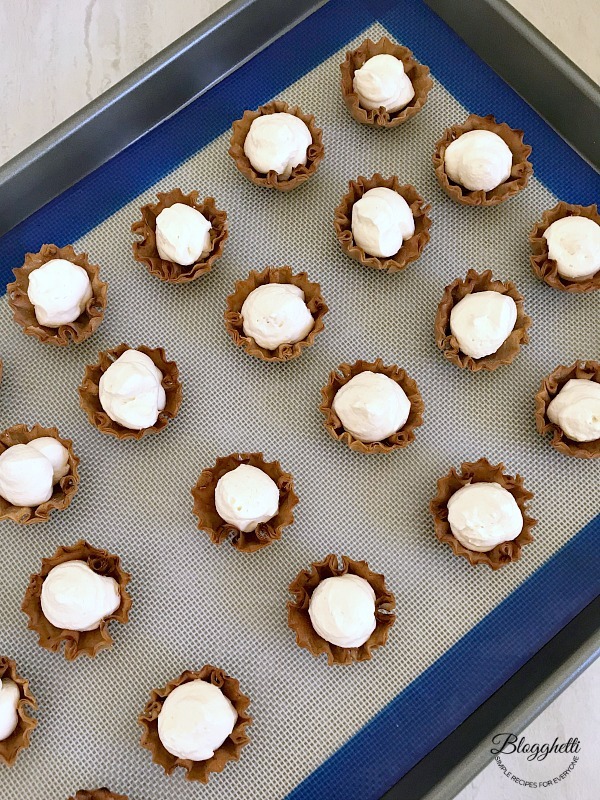 The filling for these mini cups is easier than you think to whip together. Don’t let the directions of “whisking the heavy cream till soft peaks form” scare you away. Its easy. Now, my favorite part of this recipe is the vanilla extract I used. 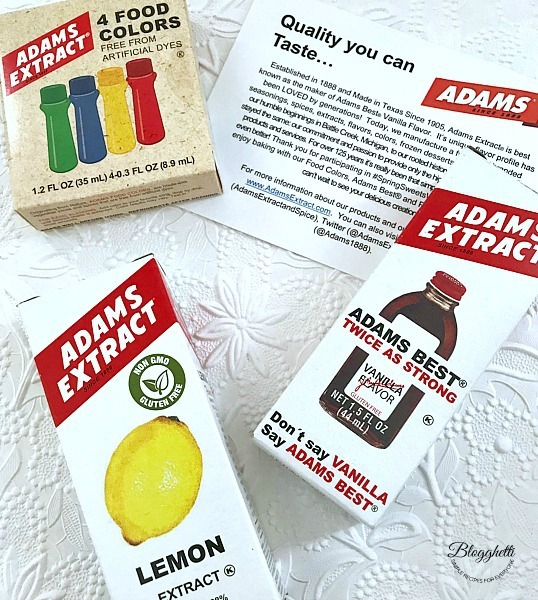 Adams Extract, one of the week’s wonderful sponsors, sent a bottle of their vanilla extract, along with lemon flavoring and box of food coloring for me to play around with. The vanilla is amazing, ya’ll! Strong but not overpowering. It was perfect for this cheesecake filling. I can’t wait to try the food coloring out on some eggs for Easter! This recipe is easy but if you’ve never beat heavy cream to form soft peaks, you’re going to think it’s a bit more than you can do. Wrong. Your stand mixer will do all the work, you just have to watch the time and check for the soft peaks. If you don’t have a stand mixer, you can use an handheld electric mixer, it will take a bit longer but it works the same. There is no need to thaw or bake the phyllo cups as they are already baked. While you are preparing the filling the cups will thaw perfectly. Add the sliced strawberries just before serving, or their juices will discolor the filling. These are best served same day, as the filling will soften the cups the next day. They are still yummy to eat, just not crisp. Be sure to enter the giveaway below for a chance to win some fabulous prize packages from our sponsors. Lay the phyllo cups out onto a sheet pan or serving tray, set aside. No need to thaw or bake the cups. In a stand mixer using the whisk attachment, beat the heavy cream until it forms soft peaks. Gently spoon the cream out of the mixing bowl it another bowl, and set aside. In the bowl you beat the cream in, add cream cheese, sugar and vanilla and whisk until mixture is smooth. Gently fold in the whipped cream by hand, using a rubber spatula, into the cream cheese mixture. Put the bowl back on the stand mixer, and whisk until combined and smooth. Spoon filling into a plastic bag, cutting off the tip, and pipe into each phyllo cup. OR, you can use a spoon to fill each phyllo cup. Place pan/tray in the refrigerator for 1hour to set. Before serving, top each cup with sliced strawberries. Best eaten same day as the cups will start to get soft from the filling. Check out the amazing prizes you can win in our #SpringSweetsWeek Giveaway in this post! What an easy and impressive dessert! I always love having some no-bake treats in my recipe box. This will be wonderful for summer entertaining. No bake cheesecake is so easy and perfect for warmer weather. I’ve never seen graham cracker phyllo cups. Now I have to look for them. Loving the bite-size! Strawberry cheesecake is my favorite cheesecake! Love that these are bite sized and no bake. These are a perfect one-bite dessert! They are so cute and mini! I love little desserts. They are un to eat and serve. Plus I always feel like I can eat more. 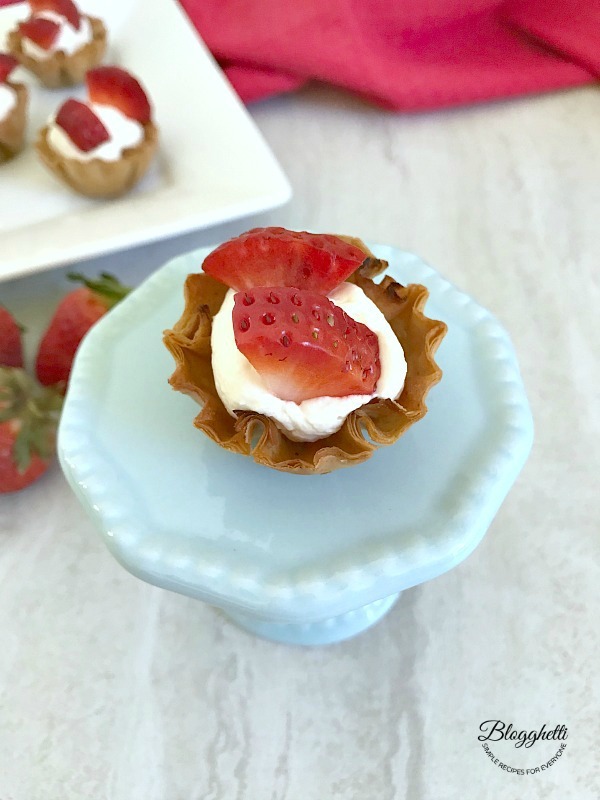 These cheesecake cups are so adorable and I can’t believe they’re so easy to make! This is such a fun dessert idea! Bite sized strawberry cheesecake? I love these little cuties. I love these beautiful little cheesecake cups! I love no-bake treats for a crowd- they make life so much simpler.